At Oliver, we know it can get pretty cold up here in the Northeast and we want to protect your home from the chilly temperatures. Whether you’re taking a long vacation or you’re heading somewhere else for the winter, it’s important to prepare your home for an extended time away to prevent potential plumbing problems. Once winter hits, water can easily freeze inside your pipes and cause them to burst. This can not only be disastrous, but can also be costly and can result in massive water damage to your home and belongings. With our Winterization Plan, we turn your water off and drain your entire system so that you won’t have to worry about your pipes freezing and bursting. When it comes to toilets, showers, bathtubs, kitchen sinks, and dishwashers, leftover water is something you don’t want sitting around during the winter. This water can not only freeze and cause pipe problems, but it may even cause damage to your fixtures. Our experts will make sure there’s no water left in your pipes we’ll even protect all of your drainage traps with antifreeze. You may not think about your water heater, your clothes washer, or your hose bibs before you leave your home, but these appliances should be winterized as well. With our Winterization Plan, we’ll disconnect your hoses and drain the water from your appliances to make sure they’re protected from the cold temperatures. 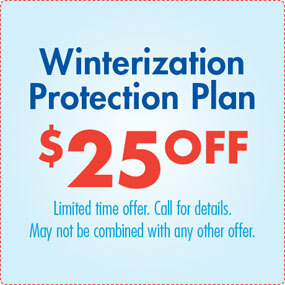 For the best in home winterization, trust Oliver. Our technicians are friendly, trained, and skilled, which means we know exactly how to prepare your home for the winter season. With our Total Pipe Protection Plan, we’ll even re-open it in the spring and fix any damage that may have occurred while you were away. Give us a call today to make sure your home is in good hands.